When it comes to mixing watches with water, Rolex has been leading the way since the 1920s. Their development of the Oyster case, the first serially-produced waterproof housing, revolutionized not only wristwatch design, but also the way they were viewed by the public. What had once been seen as delicate items of ladies jewelry were now resilient enough to survive the worst that the elements could subject them to, transforming them at a stroke into vital tools for men. The impenetrable shell created by screwing the watch’s bezel, case back and winding crown against a solid middle case still forms the basis of every one of Rolex’s professional range, with each model rated water resistant to at least 100m. But within that lineup, of course, are the trio of dive watches—pieces that take that initial Oyster concept and stretch it to the nth degree. Starting in the 1950s with the Submariner, the model against which all other dive watches would come to be judged, it was built upon in subsequent decades to include both the Sea-Dweller and, eventually, the incredible Sea-Dweller Deepsea. While the venerable Sub is now more likely to be seen as the ultimate all-rounder, worn with far more business suits than wetsuits, its two bigger brothers remain truer to their original purpose. With depth ratings standing at 4,000ft and 12,800ft respectively, these are the watches that provide the definitive failsafe for professional saturation divers—those with the epitome of high pressure jobs. Below we’ll take a look at the similarities and differences between these two giants of the sea. The concept for the first Sea-Dweller was born in 1963 at the request, and in conjunction with, Compagnie Maritime d’Expertises (Comex), a French company specializing in deep sea industrial and engineering operations. At the depths that Comex’s divers work and live, in highly pressurized environments and sometimes for weeks at a time, breathing gases react differently than they do at sea level. With oxygen becoming toxic and nitrogen causing a potentially lethal anesthetic effect known as nitrogen narcosis, mixtures rich in helium are commonly used. Notoriously difficult to contain because of its tiny molecules, helium bubbles easily seep inside watch cases, expanding rapidly on the ascent back to the surface and blowing out the crystals. In the 60s, before every aspect of a diver’s immersion time was regulated by computer-controlled, automated systems, a reliably functioning and precise watch was vital. The first challenge involved finding a way to safely expel the inflating helium before it could cause any damage, and the solution Rolex developed became known as the HEV, or Helium Escape Valve. This tiny, one-way regulator set into the case at nine o’clock allows the minute bubbles to release back out of the watch as they expand under decreasing pressure. Originally retrofitted onto the ref. 5513 Submariner, making the holy grail-like ref. 5514, it proved itself so successful that it opened up the doors for the development of the Sea-Dweller. First appearing in 1967 and starting with the ref. 1665, (also known as the Double Red Sea-Dweller, or DRSD, for the two lines of red text on its dial), it was issued with a thicker case than the Sub, along with a domed crystal to give it an uprated water resistance down to a staggering 2,000ft. Over the last 50 years, the Sea-Dweller has evolved through several references, each one adding features to further enhance its performance in timekeeping precision or to give it an even greater endurance against underwater pressures. In 1978, for example, the ref. 16660, or Triple Six, emerged sporting a sapphire crystal and a larger HEV, as well as a new waterproof rating of 4,000ft, doubling that of its predecessor. Succeeding that, the ref. 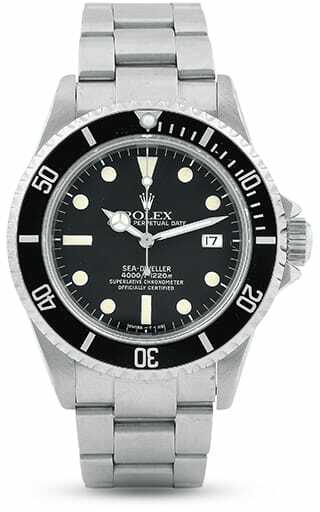 16600 launched in 1988 with Rolex’s world-beating Cal. 3135, their longest serving caliber, commonly thought of as the most accurate and reliable mechanical watch movement ever made up until that time. But, in a bizarre move, 2008 saw the highly regarded Sea-Dweller shelved to make way for the new behemoth, the Deepsea. It was a decision that bemused the brand faithful, who are generally not the shy and retiring type when it comes to voicing opinions, and the waves of displeasure eventually, six years later, permeated behind the curtain at Rolex HQ. The Sea-Dweller ref. 116600 arrived in 2014 and was welcomed back into the fray like a long-lost friend. Although it was only in production for three short years, escorting the range neatly up to its half century, it has gained an added significance among purists for something it’s missing. One immediately noticeable visual difference between the Sea-Dweller and the Submariner has always centered on the date window. Since the first Sub to be fitted with a date function, the ref. 1680 from 1969, every subsequent iteration has included a Cyclops lens at three o’clock. While undoubtedly a useful addition, many feel it adversely affects the symmetry of the dial. The Sea-Dweller has always resisted the need to have any magnification over its window, and has garnered a significant fan base because of it. However when, in 2017, the 50th anniversary ref. 126600 was released, with a never-before-seen 43mm case and the all-new Chronergy escapement inside its superb Cal 3235, there, too, was the Cyclops. Even with Rolex attempting to soften the blow by resorting to a touch of nostalgia and picking out the Sea-Dweller name in red, it has remained a controversial addition, and one that has seen demand for its predecessor skyrocket. As the last of the series without a magnifying lens, the ref. 116600 is well on the way to future classic status. Similar in name but a world apart in construction, the Sea-Dweller Deepsea surfaced in 2008 very much as a showcase for what Rolex were now capable of. The culmination of everything the brand had learned through a decades-long relationship with the pioneers of underwater exploration, the Deepsea took the concept of the dive watch to a completely new level. That level, as it turned out, was as near as damn it two and a half miles straight down. Rated waterproof to some 12,800ft, it left its Rolex stable mates and just about every other commercially available dive model paddling in the relative shallows. 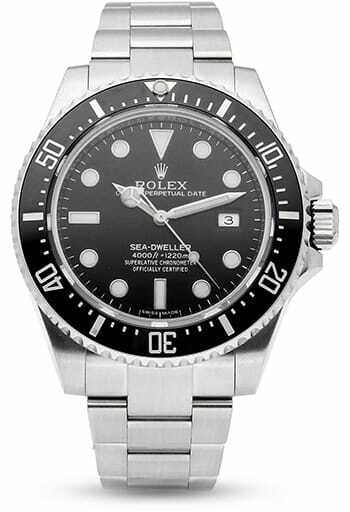 To create something capable of withstanding descents to those depths, down to the sort of places reserved for only the most specialized research submersibles, while still keeping the Deepsea’s dimensions somewhat wearable, took the sort of technological prowess few but Rolex could provide. Building a watch that can survive pressures of around 5,500lbs per square inch could of course be achieved with a ludicrously thick and outsized case, but that sort of barn door engineering has never been part of the Rolex story. Instead, they have managed to keep the outward appearance of their masterwork recognizable as part of their all-conquering underwater trio by revolutionizing the interior. With more than five tons of force to contend with, material choice for the Deepsea was always going to be a major consideration. Rolex already use the strongest steel of any manufacturer in the cases and bracelets of its standard range; the 904L steel usually found in the aerospace and chemical industries. However, even that was not going to be sufficient to guarantee the Deepsea’s performance. Forming the backbone of the whole structure is what Rolex have called the Ringlock System. Consisting of three main elements, including a crystal some 5.5mm thick, the same as some dress watches, as well as a case back made from grade 5 TA6V titanium, fundamental to the system’s abilities is an encircling central ring forged from BioDur 108, a nitrogen-alloyed steel used for surgical implants. Three times stronger even than the 904L used in the case, this band redistributes the crushing weight pressing down on the Deepsea’s crystal onto the two-part back, which is designed to flex slightly to absorb the pressure. Together, the system not only soaks up the unimaginable forces at play but also makes the watch around ten percent slimmer than anything with comparable abilities. That being said, this is not a small watch. At 44mm in diameter, 48mm including the oversize crown, and standing at a height of 17.7mm, it is the biggest piece in the modern lineup. It means the Deepsea misses much of the versatility that the Submariner enjoys, and even the Sea-Dweller can be found under the sleeve of the occasional dress shirt. The Deepsea, on the other hand, attends very few cocktail parties. It was built for a completely different environment, and for a completely different audience. As an example, visionary movie director and pioneering adventurer James Cameron has become inextricably linked with the watch in recent years. When he made his descent to the deepest-known part of the world in 2012, a valley at the bottom of the Pacific Ocean’s Mariana Trench called the Challenger Deep, a specially-made version of the Deepsea accompanied him on the voyage. Strapped to the outside of his submersible, the Deepsea Challenger, it survived the 35,756ft drop as Cameron became the first person to make the trip solo. Two years later at the premiere of the documentary made to commemorate the voyage, Rolex released the Deepsea D-Blue Dial in honor of both the man and his accomplishment. Identical to the standard model on the inside, it is topped by a dial that graduates from a brilliant blue at the top to an abyssal black at the bottom, representing the dive into the immeasurable depths. To further separate it from the regular model, the Deepsea name is printed in the same green as the Challenger Deep sub’s color scheme. Rolex wrote the book on dive watches with the Submariner. While that legendary name has gone on to get dressed up in yellow and white gold finery, underlining its new role as status symbol rather than tool, its two siblings have kept their authenticity. While very few will ever be able to test them to anywhere close to their limits, their unrivalled toughness afford a real peace of mind. Capable of amazing feats, in the most inhospitable environments imaginable, the Sea-Dweller and the Deepsea are triumphs of the watchmaker’s art.